Welcome to the website for the Harrogate District over 50s Forum. Following the successful launch in July 2012 the Forum now meets regularly and produces a newsletter entitled ‘The Voice‘. The Forum meets regularly every other month, at St Paul’s and details of the meetings are available on our Forum Events page, via the on-screen calendars and included in ‘The Voice‘, our quarterly newsletter. 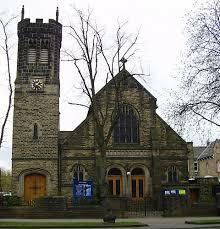 St Paul’s, Victoria Avenue, HG1 1EL (opposite Harrogate library). The entrance to the meeting hall is at the side of the church in Belford Road. The meetings often feature presentations about new initiatives and issues relating to older people in the Harrogate district and offer the opportunity for discussion and debate. Members from the Forum Steering Group are on hand to provide help and advice – and if they can’t help, they will always point you in the direction of someone who can! Members of the Steering Group also have links with other groups in North Yorkshire. If you are interested in having your say about local issues and influencing decisions about services for older people, come and join us! The Forum also has a monthly luncheon group and organises day trips and social functions on a regular basis. Details of future meetings and venues can be found on the ‘Forum Events’ page. The Forum is keen to link with other older people’s organisations on areas of joint concern and of joint interest. Please help spread the word to older people in Harrogate district. Anyone over 50 is welcome.